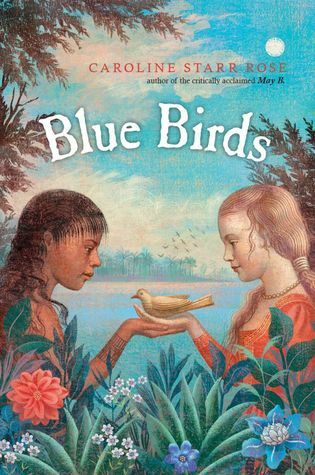 Julia’s Review: Blue Birds by Caroline Starr Rose | What is ML Reading? Another review by sixth grader, Julia. This time it’s on Blue Birds by Caroline Starr Rose; a novel written in verse. Favorite Part: When Kimi’s mom decided to let Alis stay. Favorite Character: Kimi because she was kind and selfless. How did the book make you feel? I was upset when George betrayed Alis, and sad when she left her family. I couldn’t believe she did that, especially because she loved baby Samuel so much. Book synposis from Penguin “It’s 1587 and twelve-year-old Alis has made the long journey with her parents from England to help settle the New World, the land christened Virginia in honor of the Queen. And Alis couldn’t be happier. While the streets of London were crowded and dirty, this new land, with its trees and birds and sky, calls to Alis. Here she feels free. But the land, the island Roanoke, is also inhabited by the Roanoke tribe and tensions between them and the English are running high, soon turning deadly. This entry was posted in Julia's Reviews, Middle Grade Fiction and tagged Blue Birds, Caroline Starr Rose, Julia's Reviews by mlreads. Bookmark the permalink.